Transitions in life are inevitable. Whether welcomed or unwelcomed, expected or unexpected, we all experience changes in life that can leave us feeling overwhelmed. Three years ago, David and Natalie Gregory found themselves lost in a difficult transition they never expected. 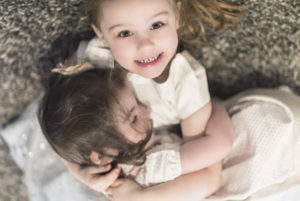 When their youngest daughter was born with serious, lifelong health concerns, they realized life would not look like how they’d always imagined. This week we asked Natalie to reflect on their family’s journey. 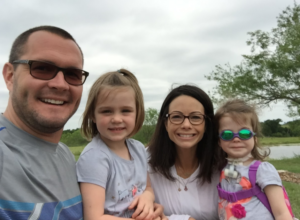 Find out how they have found purpose and embraced the life God has for their family. 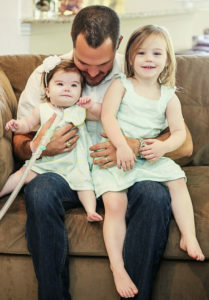 1) Your family received some difficult news when your youngest daughter was born with a rare genetic disorder. What has your family’s journey been like since then? There have been a lot of ups and downs. In order to experience the brightest joys, you have to go through some of the darkest moments. It is sometimes hard to see the beauty in the midst of the battle, but Christina has taught us to appreciate the littlest moments and celebrate how precious this life we are given really is. We had no idea that there were any complications until Christina was born. Every parent wants to hear that first loud cry from their baby. Christina’s was weak at best. She was immediately put on a breathing machine. That first night was the hardest of our lives. We were shocked that our little baby couldn’t breathe. They performed a brain scan late that evening and were unable to give us the results until the following morning. We were left that night not knowing if our baby’s brain even worked. 2) Can you describe the diagnosis and what it takes to care for Christina on a daily basis? 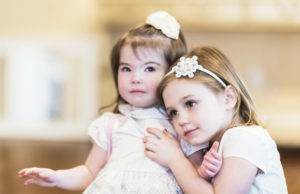 Two weeks after she was born, the doctors had clinically diagnosed her with CCHS, Congenital Central Hypoventilation Syndrome. It is a very rare genetic disorder that only 1,200 people have worldwide. It affects her body’s automatic functions. She does not know when to breathe – she literally forgets to breathe every second of the day. Her digestive system also doesn’t work right. We spent 163 days at Cook Children’s Hospital and were finally sent home as a family when she was 6 months old. 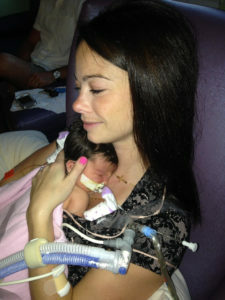 Christina will require a breathing machine at all times, as well as nursing care. She needs to always have someone trained in her care with her at all times. 3) How has God been faithful in this process? 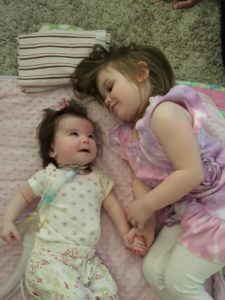 Because she was tethered to her ventilator with a 5 foot circuit for her first two years, we weren’t able to do the normal things a family does. 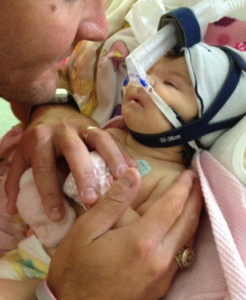 When Christina was two we witnessed a medical miracle. She had a diaphragmatic pacemaker internally placed that breathes for her. She wears a backpack with a two pound breathing machine in it at all times and gets to run around like a normal kid these days. Christina stepped foot into a grocery store for the first time shortly after her second birthday. It was just the sweetest moment, pushing our two girls around at the grocery store. It must have looked a little awkward to those entering the store – two parents crying over a shopping cart! We have learned to have empathy for others – you don’t always know what others are walking through. 4) What is it like walking this out with spiritual family? God surely placed us at Milestone for a reason. We had our friends at church bringing meals, praying for us, offering support. We had people pray over us at church and visit us up at the hospital. Our souls craved the worship and family that Milestone provided for us. We really recharge at church, but carry this through our week and relationships too. There were lots of tears shed in the beginning and honestly there still are. Our emotions are just so much more real. It’s funny what you can hear God speaking to you when you actually listen. It is so lonely and just scary in the middle of the night in the NICU, but this is where I heard Him speaking to me. Once I listened, I just can’t stop. Every worship song I hear at church and on the radio speaks to me. The messages from Pastor Jeff on Sunday speak to me. God’s word jumps off the pages of the Bible and into my heart. Even though our life has been turned upside down, it just makes so much more sense now. 5) What has God taught you in this process? Is your life now what you thought it would be? I always thought I would get married to the right guy, buy a house, have two healthy kids and raise our family together. The biggest worry I would have would be where to buy my girls their next matching outfits from. Turns out that my vision of a perfect family was just that – mine. It was not God’s. Before Christina was born, I thought that if I was a good Christian and did all the right things, that God would give me an easy, happy life. Christina has taught us that the point of life isn’t to necessarily lead an easy one, but ultimately to lead a fulfilling life that glorifies Jesus. Having a strong marriage and partnership is key to making everything else work. I don’t know what I would have done without my husband leading our family as he has. This isn’t my story – it’s ours. I was leading a great life before, but I just have this new sense of purpose now. I know that we are in the center of God’s will for our lives. And that is pretty awesome. What a great testimony. Thank you for sharing. You’re welcome, and thank you so much for commenting! Chris, thank you for commenting! Do you know David and Natalie? We love seeing our stories encourage and inspire other families that have walked through the same circumstances. Amazing story. God bless you all. The Lord obviously knew your Christina would need a special family for such a special little girl. We agree, Marie. This is an amazing story! Christina is such a treasure, and we’re so thankful to David and Natalie for sharing their story with with us. You and your family truly walk in the Spirit and stay in God’s Will. May God bless you and yours today and always?? Thank you so much for sharing your life and story with us! Your welcome, Diane! Thank you for commenting! I love this family and I love their story. To know you are right in the middle of God’s will is worth every tear and heartache. Way to go Gregory family! Thank you for sharing their story! I’ve ushered with David for a few years now & have gotten to know Natalie better through that position as well. These are truly people not just talking the talk but walking the walk. They are such a blessing to all they come in contact with & I am in awe of them both. 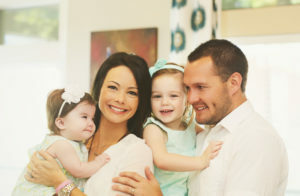 God is surely glorified through this couple and their beautiful family! We totally agree, Alicia! They are truly the “real deal”. Amazing people who are trusting God each step of the way!